Chemistry salon is currently looking to add 1 cosmetologists to our salon family. We are BUSY AND HAVE CLIENTELE! 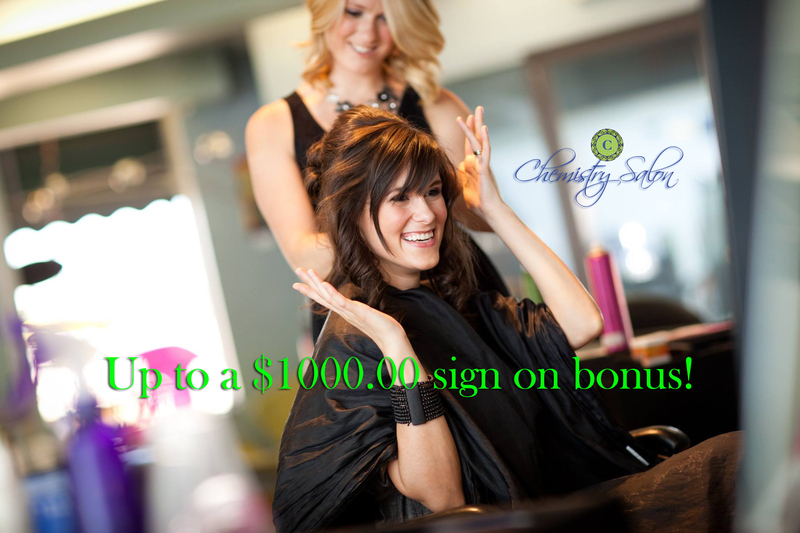 There is a sign on bonus of up to $1000.00! Great starting pay with commission / hourly options so you have peace of mind to focus on being an artist! Paid vacations, flexible hours and continuing education included. Are you an accomplished hair artist who needs advertising or marketing your business? Do you appreciate structure and opportunity for growth with a career path? As a commission stylist you’ll receive coaching for business building development and continued stylist education available with national educators. Stylists generate clientele growth through walk-in’s as well as complimentary social media and store advertising. Commission stylists have a guaranteed hourly rate with commission. Stylists will learn how to best serve existing clientele while growing additional clients with ease utilizing our associates. UNLIMITED COMMISSION AND CAREER GROWTH. We utilize a tiered level system that allows you to advance your career from Stylist to Master Designer and earn more commission and higher pricing based on productivity and sales. TOP EDUCATION. Increase your knowledge as well as your earnings with continuing education from in-house classes as well as industry taught classes. We pay you to attend training so you’re always current with mainstream trends! That’s right…FREE ADVANCED EDUCATION! CUTTING EDGE TECHNOLOGY. Our salon software app makes it easy for you to grow and track your business, appointments, and income. So you will always know where you stand at any given time. Current cosmetology or barber license applicable to state requirements. Must have a passion for people and providing exceptional customer service. Able and willing to work various schedules including evenings, weekends, and holidays. Ability to show technical skill set in terms of layered cuts, clipper cuts, and basic color application. We welcome both new and experienced Salon Professionals. For new stylists, we have a plentiful walk-in business to build your book and guest loyalty. For experienced stylists, we have 6 tiers ranging from Stylist to Master Designer for placement if you’re able to provide proof of your book and weekly productivity. Price points increase with each level allowing you to advance your career and grow your earnings. Equal Employment Opportunities (EEO) to all applicants.